What if you missed the boat on SEO? Did your season already start and you are slower than you expected? That is likely directly related to how much marketing of your business you did in the off-season. As spring and summer roll around, most marine businesses are getting into their busiest time of year. Spring breakers and family vacationers are migrating to warmer weather locales looking for good fishing, lodging, and excursions where they can make memories. However, how are they going to find you in the search engines if you didn’t start SEO 3-4 months ago? PPC or Pay-Per-Click marketing! This is a no-brainer if you are not as booked as you should be – or as fully booked as the boat in the slip next to you. PPC marketing is buying ad space at the very top of Google search results for your most important keywords. With PPC management, we have the ability to target and re-target people who have searched and visited your website, track conversions (bookings or form submittals), get better results out of daily ad spend, and so much more. This is for sure the quickest way to increase your business. Social Media Marketing! If you don’t have a Facebook or Instagram, you are really putting yourself at a disadvantage. We live in a very visual society and you can sell yourself the best by showcasing exactly the experience you give your customers. Photos and videos are worth a million words when it comes to advertising your business. People want to see what they are going to pay for. Having previous customers leave you reviews on Facebook is an easy way to establish you are an expert in your field and show that you provide a quality experience! With proper social media management, you can advertise your business fully and effectively. Start SEO now! While you might be behind in this, starting now with optimization will set you up for next season. Like I said above (and many times on this blog), SEO takes time to build up. It takes time to optimize. It takes time to see results. However, once there is effective management in place and continual optimization, your organic traffic will steadily increase and an increase in bookings from that traffic is not far away! If you feel you missed the boat in starting your online marketing strategy and are losing business because of it, please contact us so we can help! We can give you a free online marketing analysis and a 20-minute consultation with our marketing manager. She has almost 2 decades of experience in the marine industry and can provide excellent feedback and data for you to review. Fill out the form below! There are a number of things that come to mind for me that are the tell-tale warning signs a website needs to be updated. Almost daily, our team is looking at what Google, Yahoo, and Bing are requiring of websites to rank well on their search engines; we are looking into the latest technologies to give your potential customers the best experience. However, we know that sometimes you want to do the legwork yourself. In today’s post, we are going to give you 5 warning signs that your website is hurting your business and in need of a redesign. Obviously, there are some gimmes: age is definitely one of those. If it’s been 5 or more years since your last website update then it’s probably time to at least consider it. With that said, age is not the end-all, be-all when deciding to redesign. Mobile-friendly? Responsive? We have talked about this at length on our blogs. If you aren’t mobile friendly and responsive – it’s time for a redesign! Make sure you read THIS POST! Is business booming? Or is it slowing down? Steady? If it is slowing (and not due to off-season), that is an indicator that customers are going elsewhere! Does my website align with my current offerings? This is a big one. Most customers who designed their site 10 years ago had information on their site that wasn’t relevant to what the offer now. READ THIS POST to see what we mean. Are you listed on Google, Yahoo, and Bing? The modern content management systems (CMS) that we use allow our marketing team to integrate Search Engine Optimisation (SEO) into a new website, ensuring new sites get the best possible start (or restart) on all search engines. It is likely that if your site is older than 5 years old (and you haven’t had anyone managing your search engine rankings, your old site hasn’t been set up for SEO, uses outdated tech and strategies, and/or just poor site architecture, Google will find it difficult to index and, as a result, it won’t understand where your site should be listed. These are problems that plague older websites and will prevent you from reaching your ranking and marketing goals. Are you proud to share your website with potential customers? If you would rather just have potential customers call you then market your website, then that is a huge red flag. Your website should make your life easier, make marketing your business easier, make converting clients easier, and growing your business easier. If you answered “no” to any of these questions, then your current website is hurting your business instead of working for you. Naturally, some of these questions are more straight forward than others. Others rely on simple tests, others depend on data, and some are based entirely on subjective opinion. But all of these indicate your website is some level of broken and needs to be fixed, and the fix is almost always a redesign. CUSTOMER SPOTLIGHT: 300% increase since I went with Charternet! We are here with another customer spotlight! 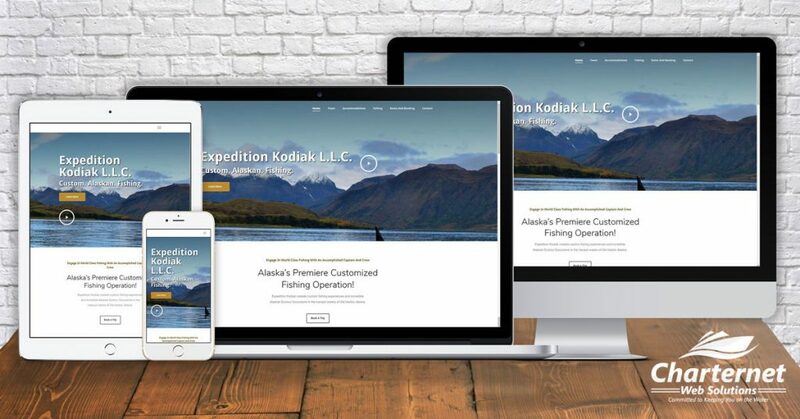 This time, we have a brand new site with Expedition Kodiak! We cannot thank Expedition Kodiak enough for teaming up with us and taking the time for this stellar review! Interested in increasing traffic to your site? Time to modernize your site and deliver the right 1st impression? At Charternet Web Solutions we deliver sites that offer easy navigation, making the redesigned websites both human and search engine friendly. We take pride in offering responsive design, a necessity for businesses to connect effectively to the smart phones and devices that are quickly replacing the desktop/laptop. Contact us today to get started! 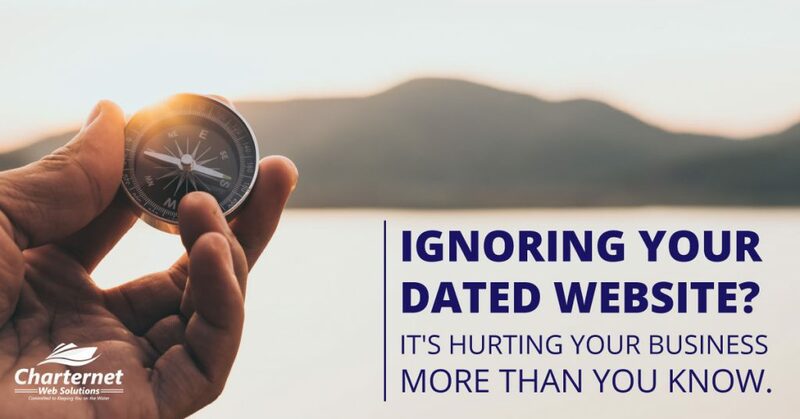 Ignoring Your Dated Website? It’s Hurting Your Business More Than You Know. We all have those things we own where we say “if it isn’t broke, don’t fix it”. Your website might technically function but, in reality, if it has been over 5 years since you have updated your website – your website is costing your business BIG bucks. More often than not, most of us think of our websites like our favorite old pair of shoes! Even though they are dated or could be performing better, we’re attached to them. Another big factor is the cost of investing in a website redesign. 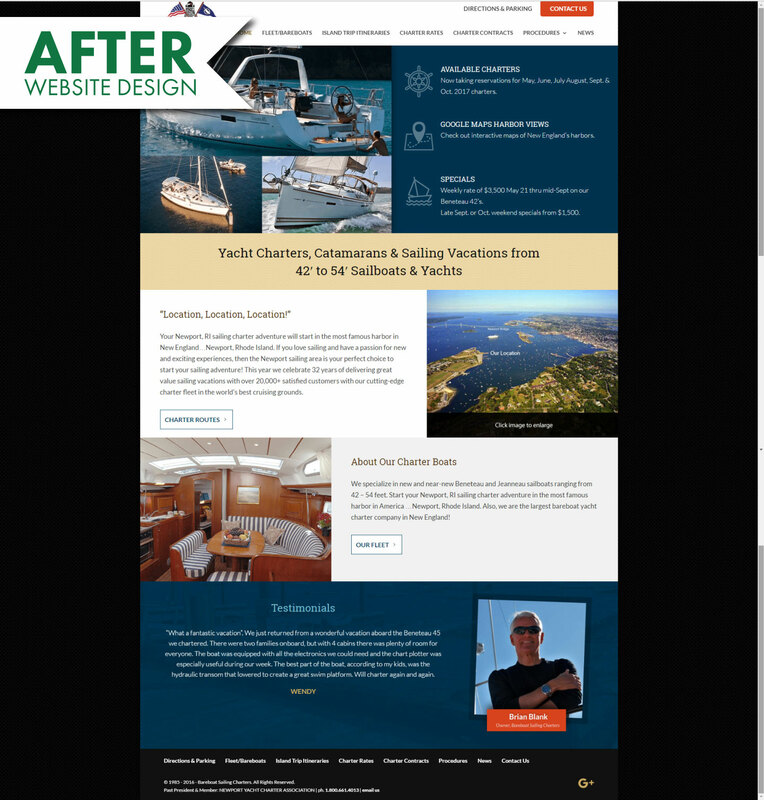 We totally understand that a website redesign is no small task or investment and most people find the task daunting because they don’t know a lot about it – so they just ignore and wonder why business is slow and no one is booking charters. But boy – does it pays dividends in the long run. One of the biggest complaints we get from our customers is that their current site is just not working – with lack of attention to your site over time inevitably you have broken links, outdated pricing, charter offerings that no longer exist, and likely a decline in your search engine rankings. 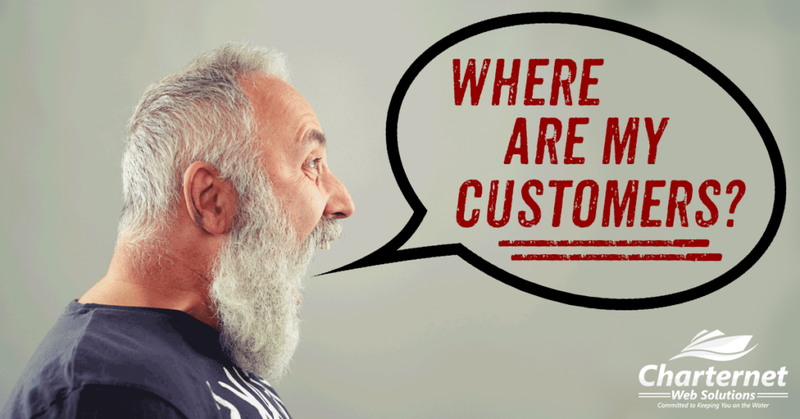 Not only is it frustrating for you a business owner, but it is also frustrating to your potential customers! More than half of the world’s population does all their searching and buying via a mobile device – whether it is a phone or tablet. That is the world we live in and if your site does not offer a modern, accurate, easy to navigate experience your potential customers notice it and are likely booking with another charter. Neglecting this for too long can have a significant impact on your bookings, income and business reputation. This should be a no-brainer – we have talked about it at length. And like we said above, more than half of the world is living, searching and buying on their mobile devices. Making sure your website functions on these platforms not only assures better rankings on search engines, but an easier, more user-friendly experiences for your customers. Plain and simple, if your website isn’t mobile optimized, chances are you’ll miss out on valuable potential customers and even repeat customers. A study released by Salesforce found that “83% of mobile users say that a seamless experience across all devices is very important.” People want to be able to get the information when and where they need it and if your website can’t deliver it to them, they’ll look to the guy in the slip next to you guaranteed. As your marine business grows, it’s almost guaranteed your marketing strategy will grow and evolve as well. 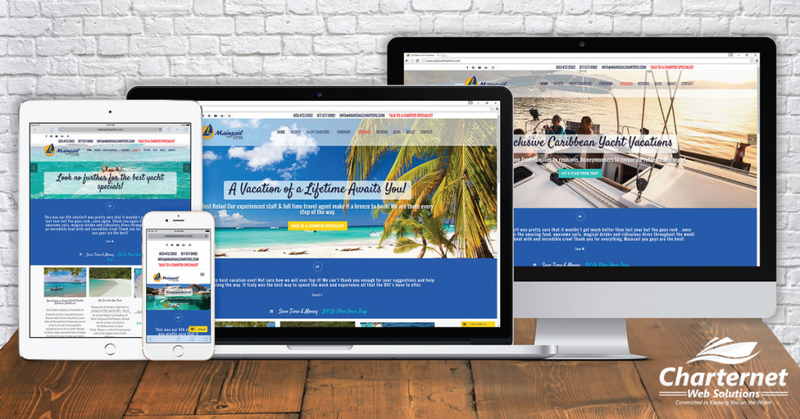 Making sure your website conveys your marketing strategy is the most important element – your website is the face of your marine business. Your marketing ideas must be replicated online because if a potential customer lands on your online storefront and finds your site is dated, hard to navigate, bogged down with errors, you are not likely converting site visitors into customer and not getting the most for your marketing buck. A well-designed, user-friendly website is one of the most effective marketing tools you have in your arsenal. If it has been over 5 years since you did anything to your website, it’s time to update. 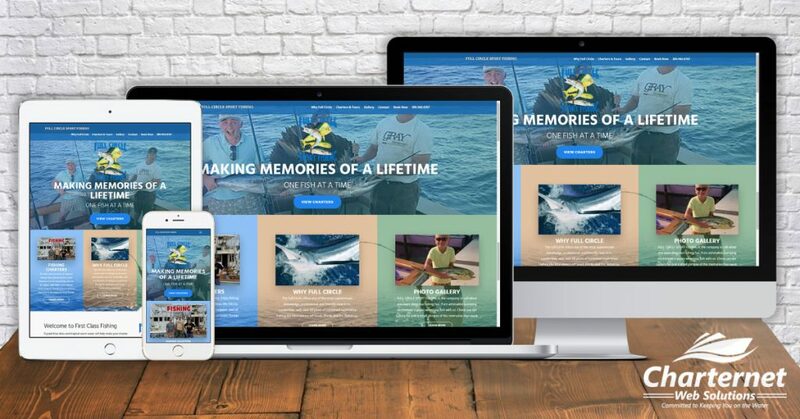 Your customers want the best on-the-water experience – from website to dock – your story should be conveyed in the best possible manner to reel in those customers! Website Launches | We’ve Been Busy! It may seem like things have been quiet over here at the Charter Web Solutions HQ – but boy, not so much! While so many of our customers have been struggling with mother nature we keep trucking behind the scenes to support their website and marketing efforts. Plus we just launched 3 recent redesign projects in the last 2 weeks. Check them out below to see just how different each fishing charter site is! No templates here – we capture the essence of each of customers on-the-water experience with a unique look! Plus there are more to coming including a few customer features where you can hear first-hand client experiences. 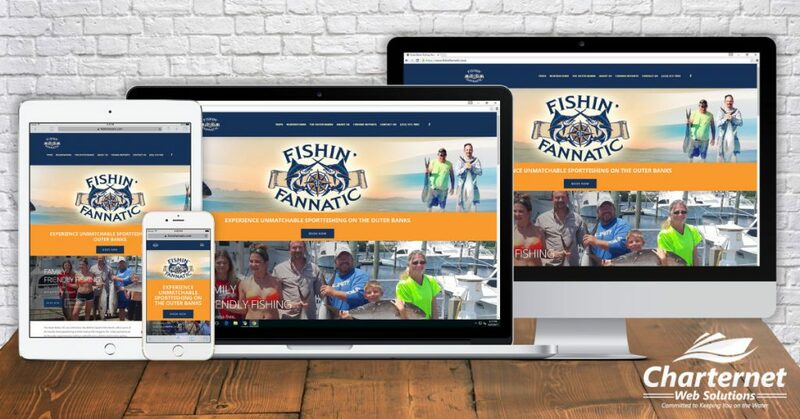 First up, we launched Fishin’ Fannatic! 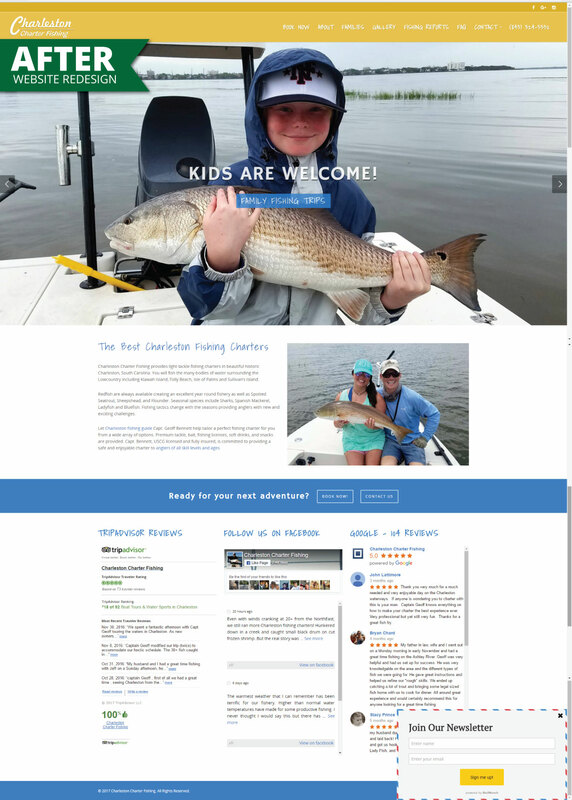 The eye catching and super-user friendly website can now accept online fishing charters in the Outer Banks of North Carolina directly on the site! Working with Brenda Fann was a pleasure and we look forward to hearing more about her experience in an upcoming customer feature! 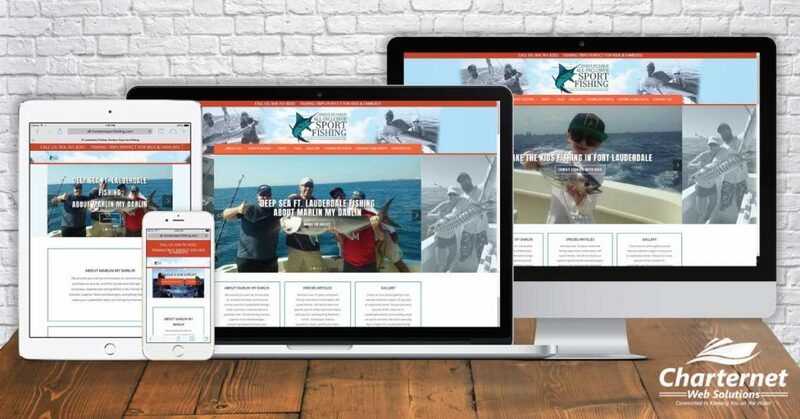 Just after we launched Fishin’ Fannatic, came the relaunch of Full Circle Sportfishing. His former site had broken links, was difficult to update, and was deterring customers from booking online. 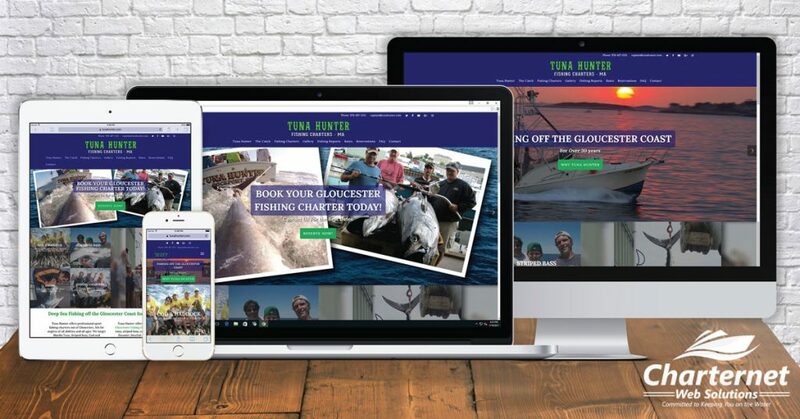 With this professional website redesign, he now accepts online charter reservations direct on his site with a slick new booking calendar. A customer feature is coming on this one as well! And just a few days ago, we launched Big Buoy Fishing! 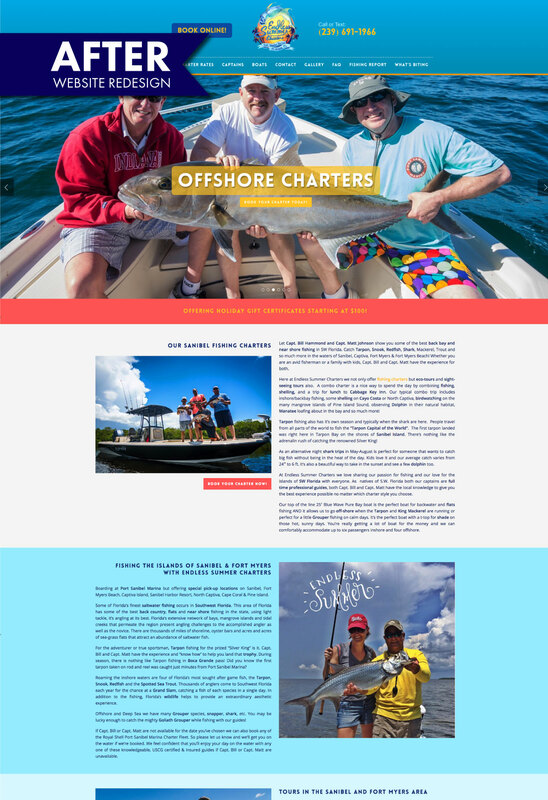 This Guatemala Fishing Charter was not conveying the right message with their old website design. 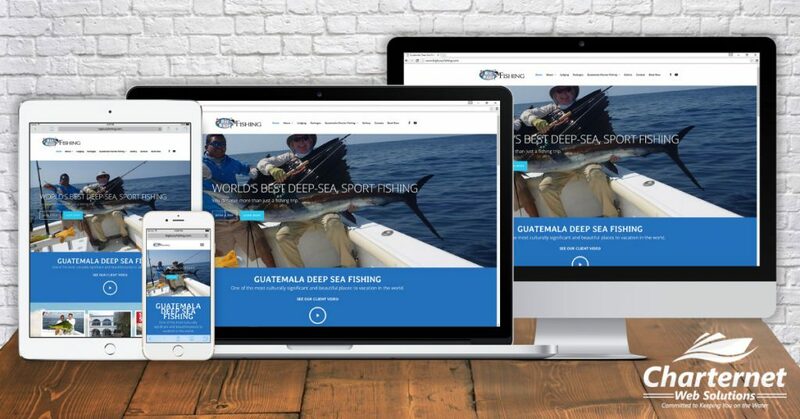 With the newly updated, streamlined website Big Buoy is getting the right message across with a full service deep sea fishing experience! CUSTOMER SPOTLIGHT: The Devil is in the Details with Tuna Hunter! Give us a little back story. In your opinion, what were the specific issues you wanted fixed with the redesign? “As web design advanced, fishing regulations changed, and social media took off, our great “new” site was dated – and I knew it. It just did not look good on a phone. Another problem was that our website was totally separate from our social media accounts, even though we had the requisite links and buttons. Keeping up with site changes and social media was a chore. In a year or so, the combination of more charter boat sites out there, our site not being responsive, and all the work to maintain both site and social media was taking a toll on us and on our rankings. It became abundantly clear – we had to change to a responsive, integrated site, and sooner rather than later. About the same time, we found we were getting dinged by Google for not having modern responsive pages – right at the beginning of our season. Ouch! Charternet was very sensitive to this and worked hard to get things done quickly. 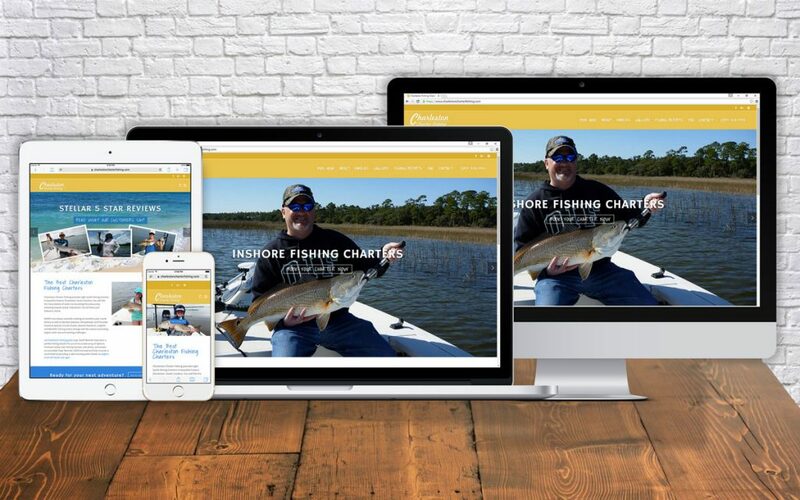 Because they know the business, they were able to incorporate features and effects that make sense for a fishing charter business. How did the redesign process go? The new site launched on a Monday. That week, we got 2 reservations via the new Reservations page – a new page where clients can securely enter their credit card info while requesting a date. No call, just direct reservations. The following week, 3 more. Now we direct persons to the Reservations page, to secure their reservation when they are ready. Plus, we have all the contact info in a database. Much simpler than doing everything by phone, and much more effective at closing a charter than we had anticipated. There was no drop in rankings. In fact, we improved on those keywords we had dropped from, thanks to focused work from CWS Marketing team. Our social media posts now appear on our page, as we post them. All I need do is blog posts which I can do on my phone or iPad or laptop! We have ONE clean modern responsive site. All our social media are linked in. Ease of updating the site when needed. 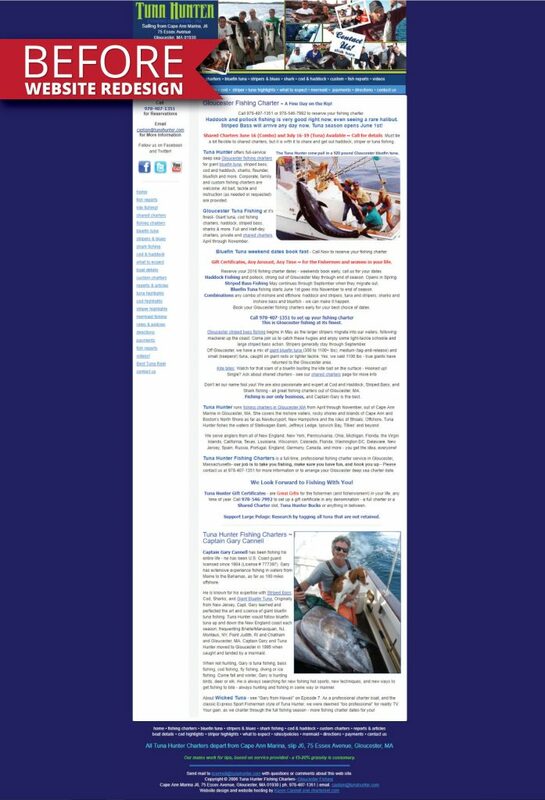 We have a site that says TUNA HUNTER! Our rankings in a short time are the same or better, and climbing. Was the redesign process worth it? “The CWS Design Team will tell you, this was NOT an easy job for them – the Captain was very picky and very leery of any changes. I actually went through everything in the first round page by page, line by line with adjustments and comments. This took time – if I wanted a certain result, I had to give Charternet every photo, text, comment, question, like or dislike, to get to a site that I really love. It was my responsibility to put in the time to give them detailed feedback. We could not have done this without Charternet – I do not have the time, the WordPress design skills, or the SEO skills. There are some nice touches – features, transitions, hover states – that the Design Team dropped in that make a subtle, professional positive difference. I would never have thought of these. We cannot thank Tuna Hunter enough for teaming up with us again and taking the time to give us all the details of their design process! 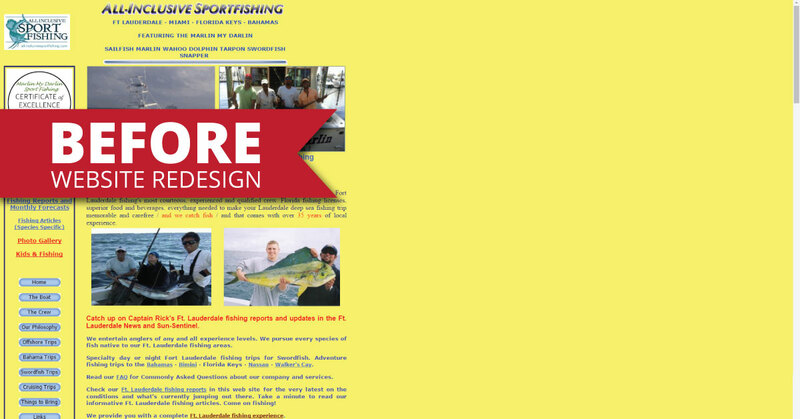 Customer Feature: A Complete 180 for All-Inclusive Sportfishing! “I decided to go with Charternet after careful analysis of related sites and conversations with many others in the ‘website business’. There is true talent and experience here with the entire team involved in active participation during my project. In parting ways with my previous host, I really had only a single but important issue – and that was accessibility. Lack of accessibility with my previous host is what led to the demise of our relationship and had me looking elsewhere. So here we are at Charternet – and I couldn’t be happier. The communication is outstanding and they are Prompt. That “P” being a capital letter is not an error. They are simply on top of everything: offering the professional advice and insight that has resulted in a beautiful site. The painful search for a new company to handle such an important decision was made a bit easier by a simple fact: they (Charternet) had two sites that ranked ahead of mine. 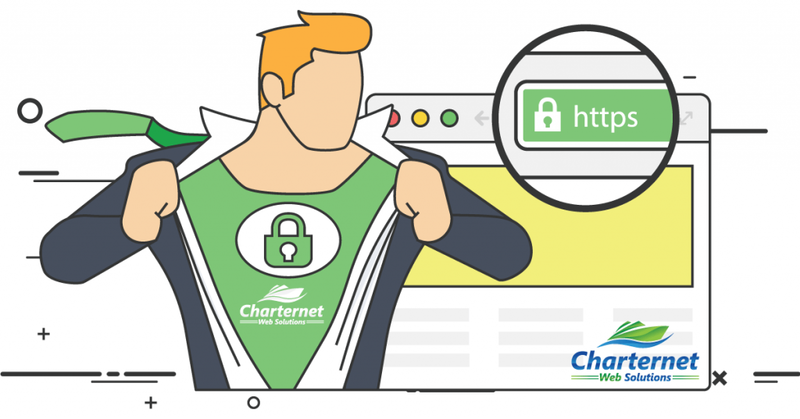 Now with Charternet on my team, we have a new and intelligent flowing site. And communication. I call with a content question, they answer the phone. An e-mail gets a quick response and always fast response from the marketing team. They find the time for me. That’s a biggie. Here we are with our latest customer feature – Global Yacht Services! 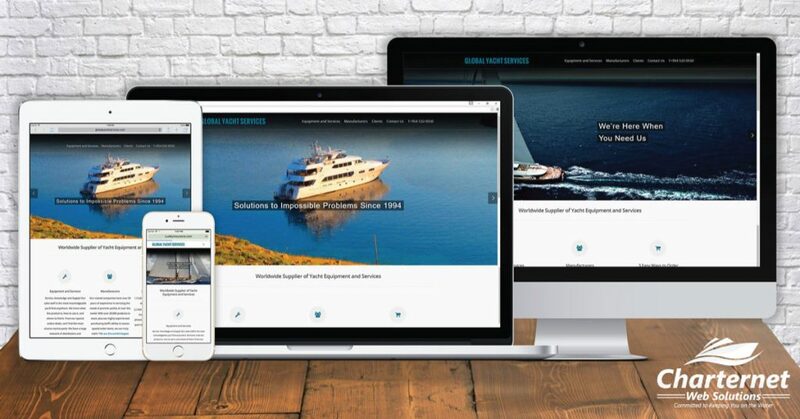 When Charternet came under new management back in 2014, the new team at Charternet Web Solutions had the honor to continue a longtime partnership with Global Yacht Services with a sleek, new website redesign! However, in this feature, we are highlighting the amazing relationship with Global Yacht Services since the launch of the site. We recently sat down with Mike, owner of Global Yacht Services, to review his feedback and see what kind of impact to the business the redesign process and continued relationship with Charternet has had! And how has your website and business been since the launch? A huge thank you to Mike at Global Yacht Services for taking the time to sit down with us and giving us your honest opinion of your experience with the Charternet team! 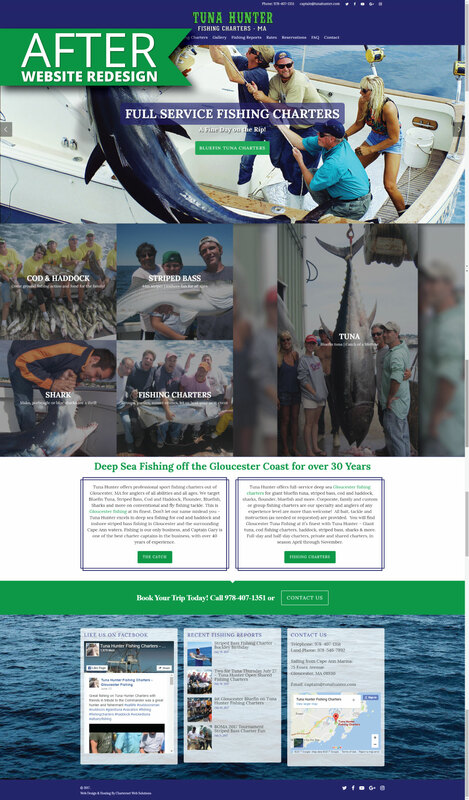 New Mobile and User Friendly Website + Booking Calendar Integration for Charleston Charter Fishing! Give us a little back story. What led you to redesign in the first place? “Two big problems. First, I could never make any changes by myself and would always have to call web guy. As a result, absent content made the blog and site seem stale. Simply changing my prices was a big deal. I also had zero ability to monitor titles, meta data and tags. This made my organic SEO growth limited at best. A huge thank you to Charleston Charter Fishing for taking the time to share their experiences with the Charternet team but let’s close it out with our favorite quote. “I wasn’t sure Charternet was right for me until…..I saw the bloopers at the end of the “Meet the team” video. I knew for sure then I would be in good hands.” – Capt. Geoff! 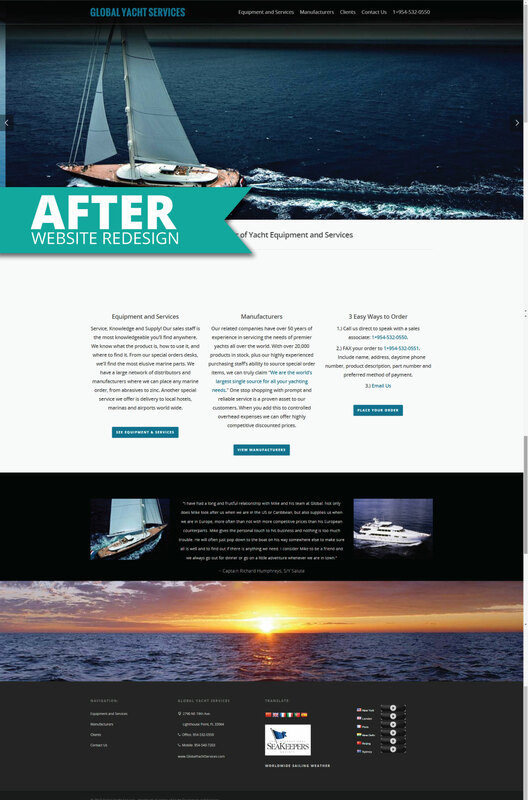 In part one of this series on Mainsail Yacht Charters, we talked about how on-going site maintenance has drastically improved user experience. If you haven’t read it already, jump on over and give it a quick read. 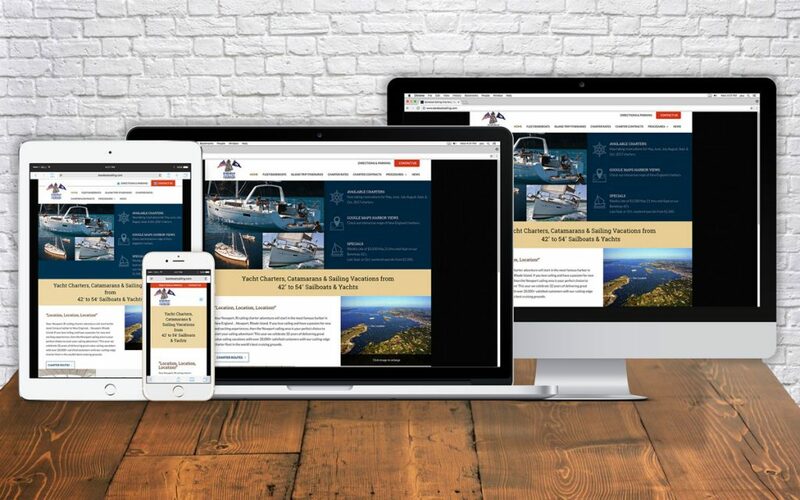 Our custom integration with Central Yacht Agent really pushed his user experience to the next level and the access to instant information, while never leaving his site, drastically improved his conversion rate! In part two of this series, we see how our marketing team continued to work with Kevin to ensure, with the upgrades to the site, that his marketing strategy was being updated as well – and the results have been nothing short of amazing. With the improvements made to the website, and specifically the specials page with integrated brochure, we are now sending more ads within Adwords to the specials page. In addition, we have updated the ad copy for our ads to highlight some of the features of the specials page and standout deals. With more quality content on the specials page, the ‘quality scores” that determine the relevancy of ads, keywords, and landing page to our audience have improved. We now have numerous keywords with 10/10 quality scores which is the best possible rating you can get for a keyword! Higher quality scores means that we are more likely to outrank competitors. This means that we are able to rank higher on the Google SERPs for less money. In Facebook, we have created visual advertisements for specific yacht specials on the specials page. We are now able to send ads directly to the yacht page on the Mainsail website that has the integrated brochure. Previously, we had Facebook ads going to the brochure website which was separate from Mainsail. Having the two integrated allows people to stay on the site longer, and explore all of the yacht details in one place. Plus, our Facebook ads have tons of audience engagement with people liking, sharing, and commenting on the ads on a daily basis. Websites are not printed marketing materials. You cannot just launch them and walk away. Your website, regardless of when it was designed, needs to be incrementally improved over time. What is needed is a maintenance schedule to ensure the best user-experience you can! Long time client, Mainsail Yacht Charters, is a great example of exactly how on-going maintenance cannot only give customer’s a better experience, but can increase business rapidly! Over the last few years, we have continued to work with Kevin to ensure his website has the most modern technology guaranteeing a better user experience. More specifically, over this past month, we have implemented a brand new integration with his booking agent – Central Yacht Agent. 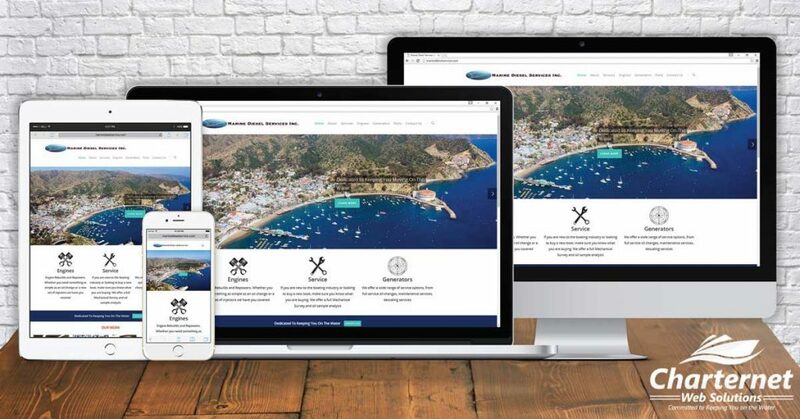 The integration we built not only ensures that yacht searches and yacht brochures are fully accessible from the site, but more importantly that they are all contained within the site with the same look and feel as the existing site! This is crucial to a successful online SEO marketing strategy. Linking people off your site does nothing to grow your SEO results – which is exactly why Mainsail had us undertake this custom integration. A Website Update Boosting it “Light Years” into the Future Featuring Marine Diesel! Once upon a time, in a galaxy far, far away, we had a customer that wanted to exchange services. He ran a website hosting company and offered to get us on the internet with a ‘great website and launch our exposure into the stratospheric’! And with that, a deal was struck: we would work on his boat and he would create a website for our business. The website that we received from him was not at all what we had expected. It was too dark, had no information, and graphically it was a disaster. To top it all off the contact page didn’t work and there was placeholder content everywhere – for a year! Getting in touch with him to fix these issue was next to impossible and if he did make some changes, he usually broke something else. The worst part was that we felt embarrassed to send any customers to our website. As a result, we just kept it on the back burner – basically pretending that it didn’t exist. Occasionally, my boss asked me to change the graphics around and try to link some pages together, however I am not a web designer so it was still amateur status at best. Prior to our redesign, the majority of our business comes from word of mouth. It is a small industry on a big coast and in the beginning, business would be local with a few exceptions of people out of state looking for hard to find parts. A lot of where we would spread our name was on boating forums and through Ebay sales. Many of our customers are world travelers and our name would get around that way. Our base of manufactures has also helped to get our name out there. That all changed once we sat down and had a professional company look at our website. Charternet Web Solutions worked with us on getting a more user-friendly, refined, and informative website. How they explained everything and how they laid it all out for us, we knew right away this was going to be a worthwhile investment. Being able to work with a company that truly knew our industry and had the ability to give us what we needed played a large part in us deciding to go with Charternet Web Solutions! Since our website redesign, we have been able to step our marketing and advertising up a notch without being embarrassed on where we are sending our potential clients or worry about marking the wrong first impression! 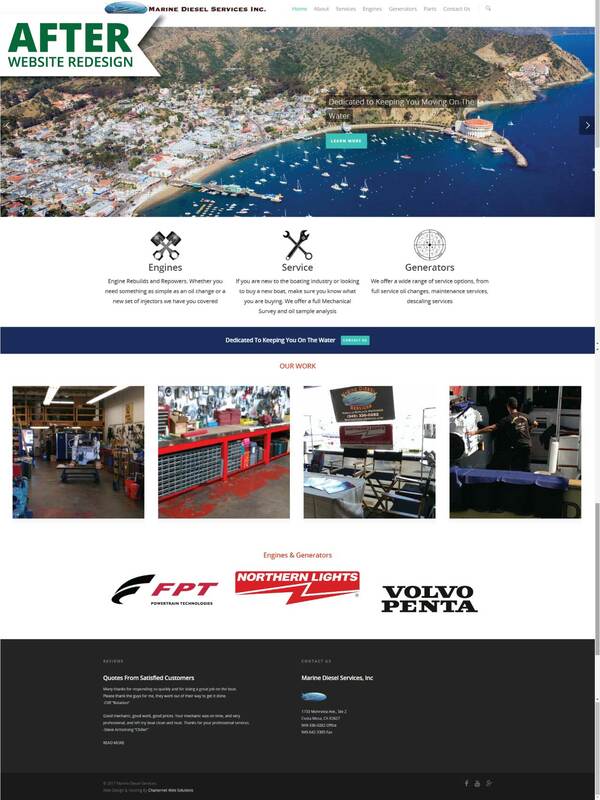 Also, our new website gives us more exposure over the internet by allowing people to search for specific services or parts and have our website come up. It doesn’t look like a thrown together, placeholder site anymore. This gives our current customers a reliable avenue to contact us – where ever they are in the world! Plus, we have the added bonus of the manufactures that we are dealers for have a great site to add their name to. And we know they are happy to put their logo on our website and get the exposure they deserve! Over all, our website redesign experience was painless and effortless. The team at Charternet Web Solutions is very professional, informative, and have a level of expertise that will give you the piece of mind that your website will be on the cutting edge of web design and innovation. 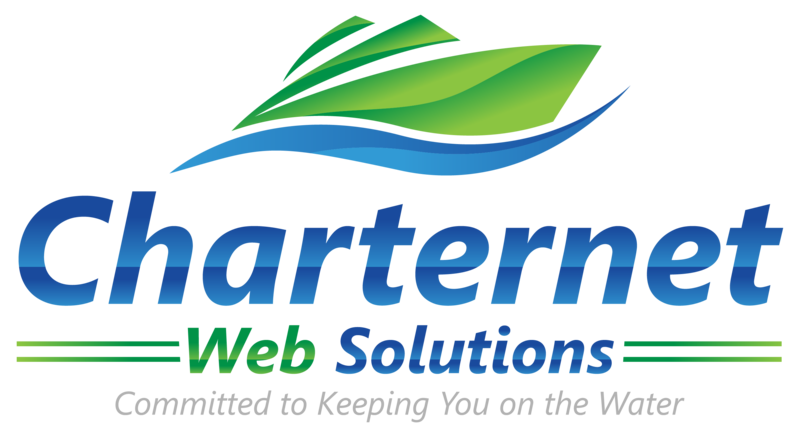 Their knowledge about our industry, courtesy, attentiveness, and continued quick response have made us at Marine Diesel Services happy to be a part of the Charternet Web Solutions family. We cannot thank Marine Diesel Services enough for taking the time to write out their opinion of their experience with the Charternet team! Time to modernize your site and deliver the right 1st impression? At Charternet Web Solutions we deliver sites that offer easy navigation, making the redesigned websites both human and search engine friendly. We take pride in offering responsive design, a necessity for businesses to connect effectively to the smart phones and devices that are quickly replacing the desktop/laptop. Contact us today to get started! Here we are with our second customer feature this month – Bareboat Sailing Charters! 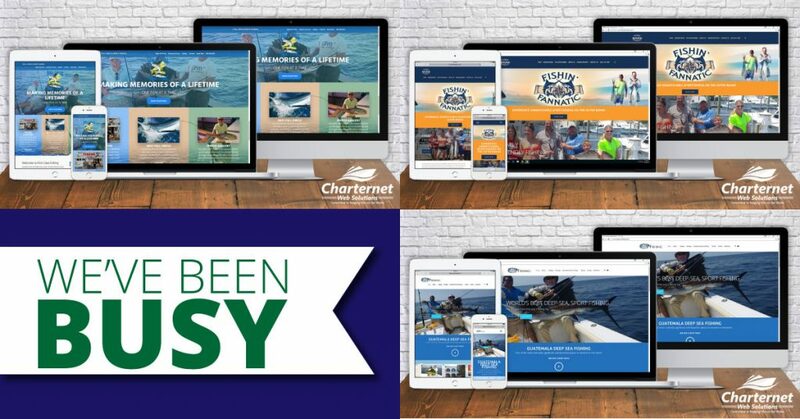 Over the last 2 months, Charternet Web Solutions had the honor continuing our longtime partnership with Bareboat Sailing Charters with a website redesign to consolidate 5 websites (with identical content) down to a manageable, modern, user-friendly website that would convey what Bareboat Sailing Charters is all about. We recently sat down with Brian, owner of Bareboat Sailing Charters, to review his feedback and see what kind of impact to the business the redesign process has had! Bareboat Sailing Charters specializes in chartering new and near-new Beneteau and Jeanneau sailboats ranging from 42 – 54 feet. They start your charter adventure in Newport, RI in the most famous harbor in America – Newport, Rhode Island. Also, they are the largest bareboat yacht charter company in New England! Give us a little back story. 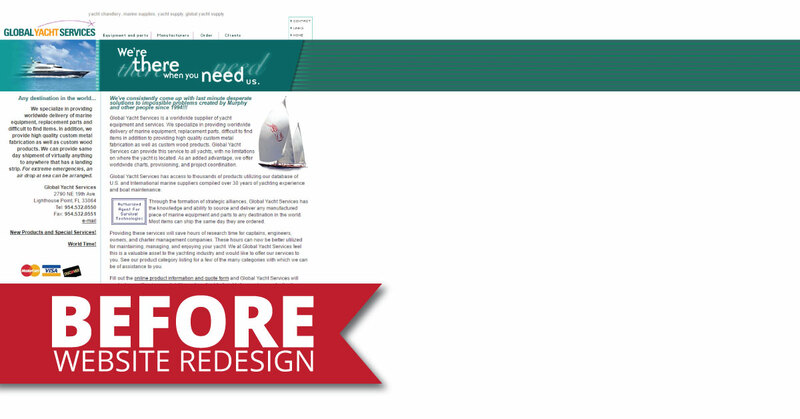 What led you to want a redesign in the first place? In your opinion, what were the specific issues you wanted fixed with your redesign? A huge thank you to Brian at Bareboat Sailing Charters for taking the time to sit down with us and giving us your honest opinion of your experience with the Charternet team! 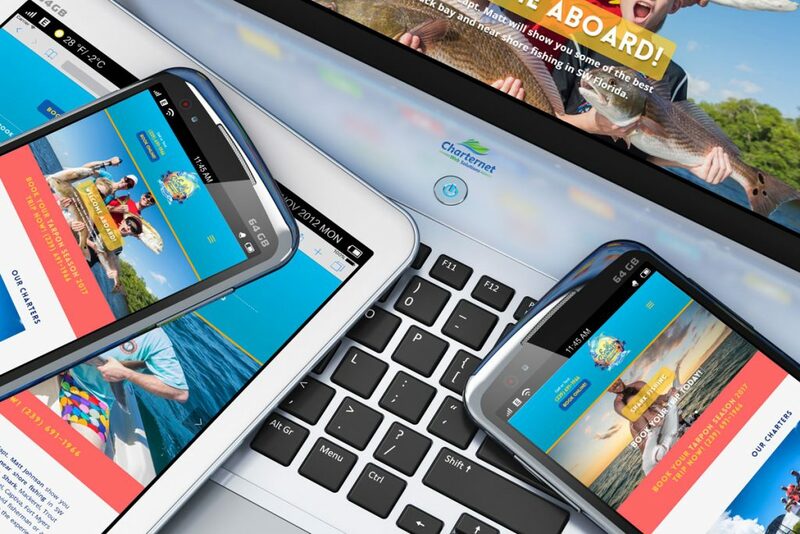 Mobile Friendly Redesign & Marketing Management Boost Traffic at Endless Summer! We are excited to highlight our next customer feature – Endless Summer Charters! 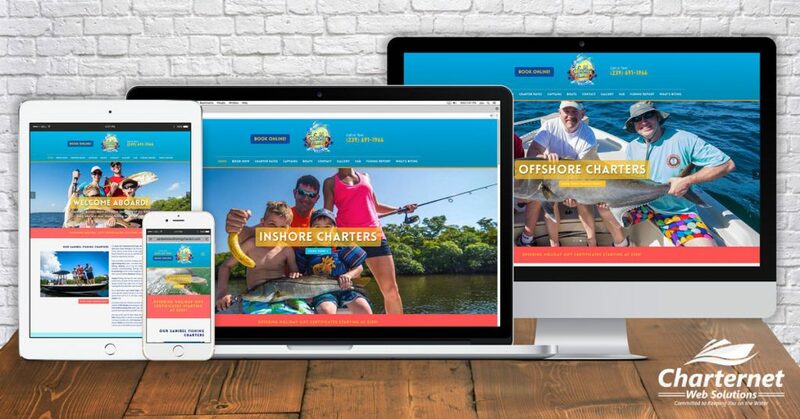 Charternet Web Solutions had the honor of partnering with Endless Summer a few months ago to tackle 2 of their biggest hurdles: redesigning their dated website with a modern, customer-luring, responsive design and tackling their organic rankings with SEO management. We recently sat down with Angela to review her feedback and see what kind of impact to the business the redesign process and marketing management has had! Endless Summer Charters will show you some of the best back bay and near shore fishing in SW Florida. Whether you are an avid fisherman or a family with kids, everyone at Endless Summer has the experience for both. Plus, they offer amazing eco-tours and sight-seeing tours! The whole crew at Endless Summer loves sharing their passion for fishing and the islands of SW Florida. Now that your new website is launched, what has your experience been? From an analytics standpoint, we have seen an amazing change in traffic based on the redesign and active marketing management. We have increased an average of 20 spots in Google, Yahoo and Bing rankings since the re-launch in September and 30% of the key word rankings are brand new! Thanks Captain Bill Hammond and Matt for being our entire family's go to for amazing fishing for 7 years now! It's safe to say the whole extended family, generation after generation loves you guys and every year we look forward to the adventures you bring us! Thanks for the memories!!! This is only a glimpse!! My husband, daughter and I had a great day fishing with Captain Bill. We caught many different fish... including a baby grouper and a stingray. Captain Bill moved us around during the day to help us find fish and was extremely knowledgeable about the entire area. We didn't take home any keepers but we all had a wonderful day together on the water. Can't ask for much more!. The weather And tides were a challenge. With that said, the trip was one of the best charters I've booked! Bill Was a great guide and managed to , despite the poor conditions, get my dad his first snook. We all had a great time and WILL book out next charter with Endless Summer. A huge thank you to Angela and the whole crew at Endless Summer for taking the time to sit down with us and giving us your honest opinion of their experience with the Charternet team! We have talked a few times on how most search engines, with Google spearheading the change, are dinging your rankings if you are not offering the most user, mobile and search engine friendly website you can. And now Google is adding another level to their quest and getting tough on websites that are not encrypted. For those of you who don’t know, an encrypted website is a website that uses a secure connection to access the site and a session key is used to encrypt all transmitted data. Your browser connects to a web server or website secured with an SSL certificate (indicated with https versus http before the domain name). Website that do not use encryption or SSL allows easier access for outsiders to capture potentially secure information, including important user names and passwords. Unlike before, HTTPS pages will now have an actual boost in search results and will be shown to users by default. What this mean is you need to ensure you’ve implemented SSL/HTTPS security certificates properly to provide the best possible experience for visitors and retain your existing search positions. 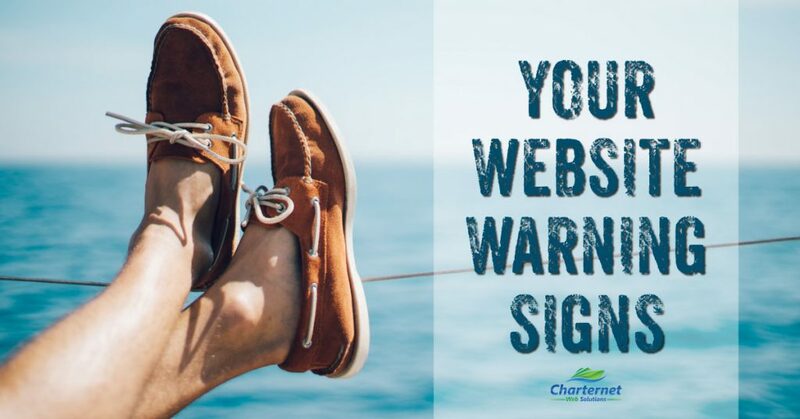 If you require your customers to give personal information or credit card info to book or buy anything on your marine business website, the Charternet team is here to make the transition as smooth as possible for you. We have been dealing with website encryption and SSL security measures for the marine industry from the very beginning! We can get your SSL certificate bought, installed, and updated yearly so you don’t have to worry about that red flag warning. Our experience with fishing charters, yacht brokers and water adventure companies combined with good data and knowledge means your marine business can continue doing what you do best and ensure all of your customers information is secure! A two-year-old website may be too old! With how often the web changes, an outdated website runs the risk of not displaying properly in the web browser, having unexpected formatting issues, or not showing up effectively in search engine results. For this reason, a site that is even two years old may be antiquated if it has not kept pace with these changes. A good website design ranges between $1200 – $5000. If you’re surprised at this range, we completely get it. But think about the number of man hours and collective brainpower that goes into optimizing websites for search engines, making content accessible across browsers – including mobile devices like cellphones and tablets, and improving overall performance by speeding up your website’s loading times. There’s a big difference between responsive and mobile web design. We talk about the subject a lot and for good reason. These are two very different approaches to shifting screen sizes for different devices. In the simplest terms, mobile design is restrictive. It serves up a separate, and often limited, version of your website that can be used on smartphones and tablets. However, because mobile websites generally provide visitors with the bare basics that the site has to offer, they won’t get to see the full glory of your web design or use it to its full potential. Responsive design is extremely flexible (what Charternet specializes in), allowing websites to resize and reflow their layout based on the visitor’s screen size. This gives visitors a consistent experience from large-screen, high-resolution monitors all the way to the smallest smartphone touchscreens, while also having an experience that is suited to each of those individual devices. Responsive websites will simply adapt to their environment, while maintaining the same stunning images, typefaces, and navigational options – and you don’t have to maintain 2 websites! The ins and outs of website design are in fact mind-boggling, and a high level of updated awareness and attention to detail to create the best website possible is a necessity. Keep these facts in mind as you look to growing your web presence in preparation for next season! Interested in having your site capture what your business is all about and everything you have to offer? We at Charternet Web Solutions deliver sites that offer easy navigation, making the redesigned websites both human and search engine friendly. We take pride in offering responsive design, a necessity for businesses to connect effectively to the smart phones and devices that are quickly replacing the desktop/laptop. Contact us today to get started!